Statehood supporters Jaime Fearer & Geoff Hatchard officially just became Californians. While we are sad they no longer live in the District they have once again proven their commitment to our cause by requesting license tags from the state of California that if approved will be a wonderful and simple statement in support of DC statehood: http://ow.ly/i/5sSjr Their tags should motivate the District, our citizens, and our leadership to transition our messaging from simply complaining about what we have toward advocating for what we deserve: statehood. In 2000, the District of Columbia changed the standard license plates to include the phrase Taxation Without Representation as a way to help raise awareness about the unfair system we live under. Our status is the very status that our founders fought a war in opposition to yet over 230 years later taxation without representation is alive and unwell in the capital of the nation they founded. The phrase is recognizable, powerful, and to the point but it makes me wonder if the District should also provide the citizens with another option, one that is not simply a statement of what have but a statement advocating what we want and deserve: statehood. We deserve statehood because we fulfill all obligations of citizenship yet are denied the full rights and privileges of citizenship. 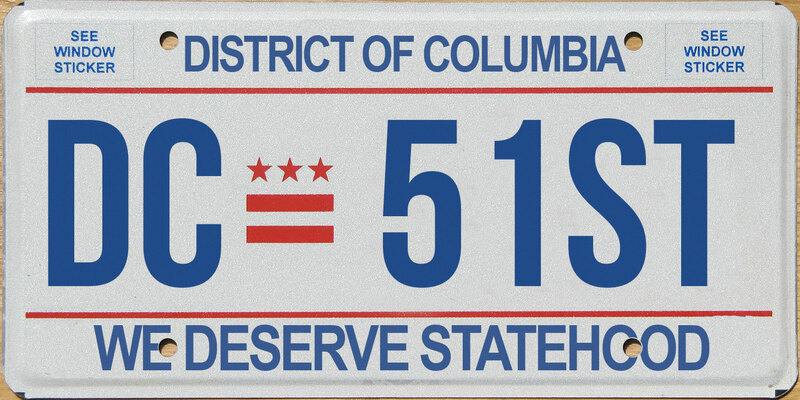 Taxation Without Representation is a good standard issue plate (because it’s truth is undeniable) but I think the District should start issuing the above pro-statehood tags. These tags could be issued for a set fee similar to the Anacostia River tags that help fund cleaning up the Anacostia River. The We Deserve Statehood tags could go to fund either the Shadow Delegation, increase annual funding for statehood activities from the Office of the Secretary, or go toward an executive office focused on statehood. This new license plate would give citizens a new venue for both advocating for the cause and funding advocacy activities. Educating our fellow Americans about our unequal status is important but it’s time to begin the transition in messaging to start sending a clear message to all about want we want and what we deserve. In this election year there will be plenty to debate and discuss but this should be one simple act that the Council, Mayor, and the citizens can all agree upon, let’s give the citizens the ability to advocate for statehood and help fund statehood efforts if we so choose. I’d surely pay for them and I bet others would too. Thanks to @CreateDC who did the graphic design work that created the We Deserve Statehood tags.